In many environments after installing the stock ESXI image you end up wanting perform an update with the latest patches, update drivers and maybe even remove drivers. VMware’s Image Builder PowerCLI cmdlets provide a method of taking a stock ESXI image and performing such tasks, resulting in a customised ISO that’s ready for deployment, hopefully saving time when building up a new ESXi server. A custom ISO, together with AutoDeploy could mean that you have a fully automated method of building that ESXi server. Below I walk through the creation of a customised ESXi ISO. Starting off with obtaining the drivers and updates that you may want to include through to the creation of the ISO using VMware’s Image Builder PowerCLI cmdlets. At this point I’d also recommend reviewing what patches have been made available since the release of the bundle to see if there area any that you’d like to include in your new image. You can head on over to the Product Pages portal at https://my.vmware.com/group/vmware/patch to review and download any updates. Select the updates that you require and download locally to c:\temp\updates. We’ll be integrating these into our ESXi image as part of our script. Image Profile:logical collection of VIBs. That’s the downloads taken care of, lets start with the script. Initialise some variables that we’ll be using. I’ve used c:\temp as my base directory for the images, drivers and updates. You can change this as required. There are also a few options to determine if you are to include VMware Tools and whether or not only security updates (and therefore not bug fixes) are to be integrated. Here we added the offline depot from HPE, selected an image profile and then created a clone of it and this is profile that we’ll we updating. In our v6 example, we have two profiles one with VMtools and one without. The no-tools version is usually smaller and has less memory overhead, well suited to quick deployments with Auto Deploy. 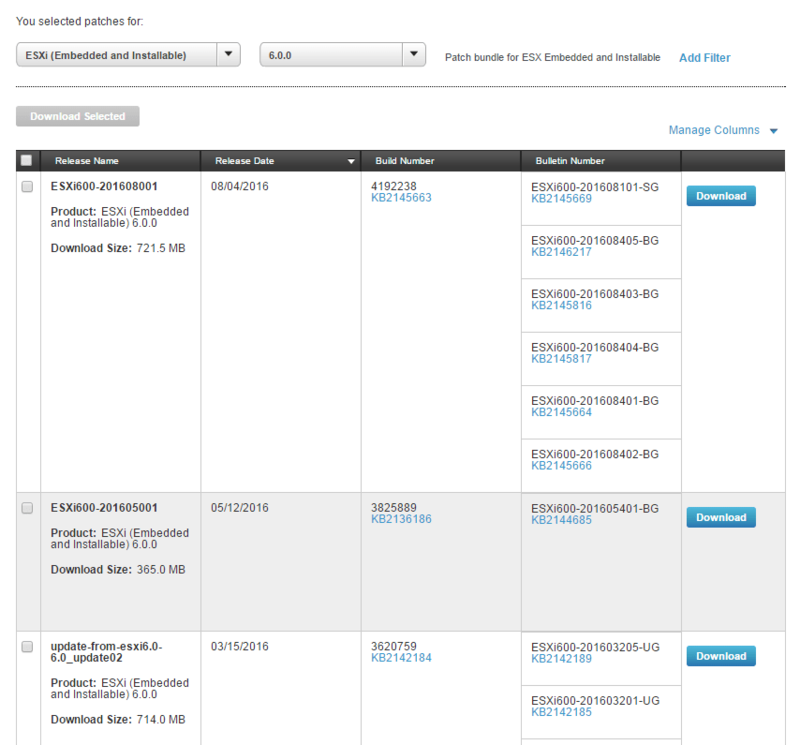 Next we add in the VMware HA agent (vmware-fdm) into the profile. If you plan to create a HA Cluster then this will save time enabling HA. The agent is pulled directly from your vCenter server. Before we started we collected together the updates that we wanted to add into our new ESXi image. Above we cycle through all the updates in the folder and add those depots into our session. Collect the image profiles that we are interested in. Filter for security and tools, and also exclude the vendor image profile that we imported in the first place. We should be left with the profiles that correspond to the updates that we want to include. Finally we export out the ISO and offline bundle. It’s a good idea to export out the bundle as you can use this when you want to make further incremental updates. This ISO can now be used to install ESXi onto your hardware, whether that be through a manual method or using Auto Deploy. Thanks for this post. Really cool stuff that is relevant to the newest technologies. Is the 2nd half of this line meant to be #commented-out? Not sure how to select the desired image. Yup, good spot! Uncommenting that portion will mean that you are presented with a GridView from which you can select your desired profile. (I must have left it uncommented as the HPE image only has one profile. I’ll update the code). Out of curiosity, what image are you customizing? Ah OK, in theory it should work. Let me know the results, I’m happy to help troubleshoot / update the script if need be. Sandeep, you’re right. It worked seemlessly. I logged in after applying/installing the new OS and verified the vib list and both were listed. Thanks again for this script. As the process is straight forward I can’t see why the ISO can’t be kept inline with the production environment. So if you patch in production, roll that update into your ISO. Then if you need to re/build a host it won’t require subsequent patching. Extremely useful if you plan to use Auto Deploy (hopefully I’ll write that up too). I was trying to create custom image, but faced the issue, when I was patching ESXi 6.5 with the latest VIB from VMware 7526125 (2018-01-09). All async vibs were overwritten and downgraded by this patch, like when you do “esxcli software vib install” instead of “esxcli software vib update”. Is there any option to patch image without updating async drivers? Just meltdown and spectre fix? Hey – I’ll try and get a moment to refresh my memory around this (off the VMware scene at the moment). If you figure it out yourself, drop me a note!